A Miracle of Science: But then the flaming sphere of light turned against sentience. When I sent Mark a chunk of the finished script a month ago, it ended on this page at the end of the second panel. I usually try not to end in the middle of a scene, since I want to send Mark completed scenes. This allows him to lay out things with much more ease. 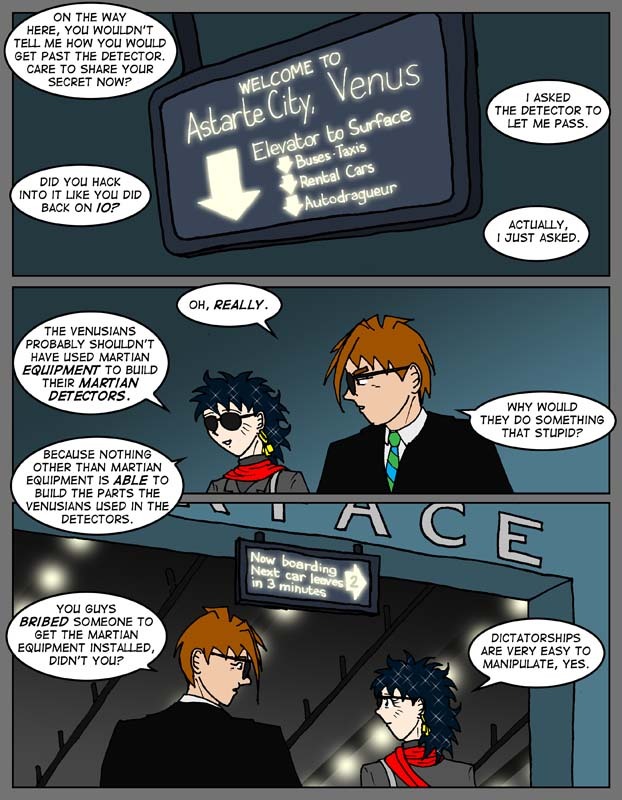 However, the third panel - which now contains two lines - was at one time a huge, bloated mess of a thing that was about ten times longer and included a discussion of how and why the Venusians had been hornswoggled into using Martian equipment. In other words, it contained background material that probably belongs in the background, where it can be inferred from the story itself. I firmly believe that readers who are interested in that level of detail will have much more fun imagining it for themselves. I know I do. Besides, there's another reference to this in a later scene with Haas which helps fill in some details. So I spent a couple of weeks condensing things until I could send Mark a script with a finished scene. Which you see above. Which brings us to here, and to me writing this. And, um, I'm done now. To the extent that it's anything at all, the surface transportation area in the Astarte airport is based off the Blue Line station at O'Hare International Airport here in Chicago. If I hadn't wussed out on you guys, you would have gotten a keen beauty shot of the huge diagonal elevator/subway cars used to get to the surface. Sorry. Also, I have no idea what an "autodragueur" is. Probably something futuristic, would be my guess.